Helped a friend with a big project, today. Two hours over. Eight hours on site. Two hours back. An hour on the phone following up. Numbingly long day. And I see more of them in the future. On the drive home, I pass this strange vehicle. It looks like some kind of short bus. Cartoon kids in the windows. Big plastic lights. Hulking fenders. And it ambles along demanding everyone's attention. As I cruise past, I see the sign on the side. 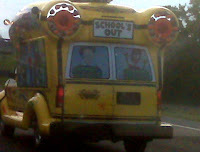 It is an ice cream truck. How could any kid NOT love it?